Improves the digestive system- A problem as common as gas, acidity or indigestion for which you take medicines often can easily be treated by drinking copper charged water. 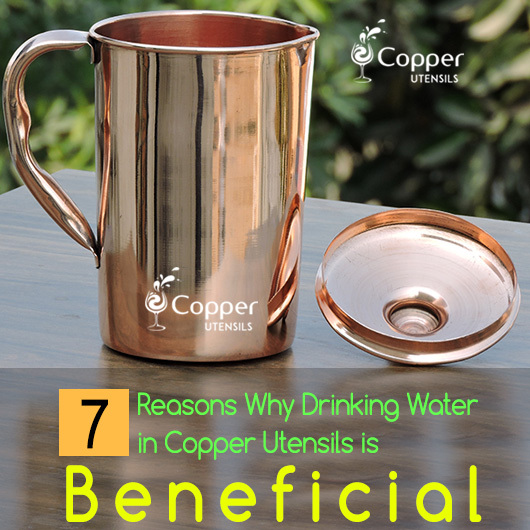 Copper has antibacterial properties which help in killing the bacteria or other microbial elements present in the water. It also stimulates peristalsis or the rhythmic movement (contraction and relaxation) which helps in getting the food transferred through various stations of the digestive tract. Regular consumption of copper water also helps in reducing the inflammation of the stomach. Helps in weight loss- Have you tried almost everything to lose those extra kilos but still can’t get the results you are aiming for? Well, maybe it is the right time to try one of the best home remedies to lose weight. 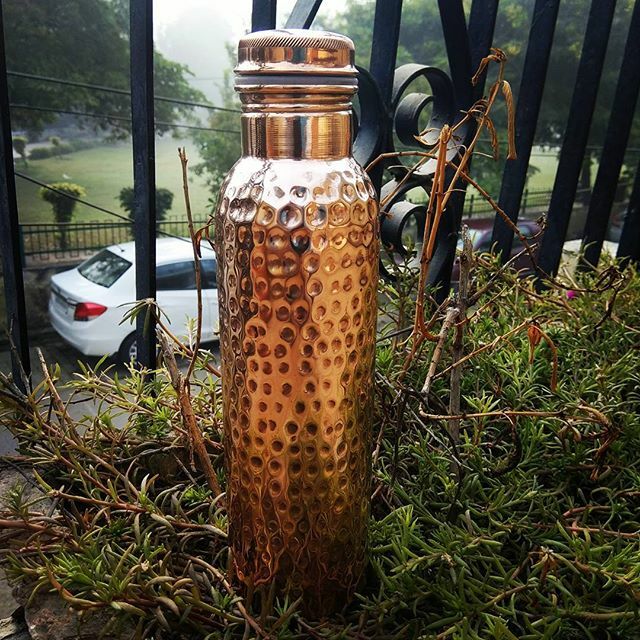 Ayurveda suggests that drinking copper water on an empty stomach every morning may help in regulating and maintaining a healthy body to fat ratio in your body, thus making you lose weight. Slows down aging- Aging is inevitable and we cannot stop it entirely. But that does not mean that you cannot slow down the process of aging. There are several remedies which can help you prevent the early signs of aging but copper water is definitely the easiest of all. It is packed with anti-oxidants and cell regeneration properties which help in the formation of new skin cells and fights free radicals which are the main culprits behind the early signs of aging. Helps in maintaining cardiovascular health- In the recent times, heart diseases have to turn out to be one of the most common diseases of all. And, it is shocking that a majority of people from the younger generation are falling prey to these diseases. Luckily, a remedy as simple as drinking copper treated water could help you in preventing these diseases. According to a study at the American Cancer Society, copper can help in regulating the heart rate, blood pressure and lowers the cholesterol level. It also helps in controlling the deposition of plaque and also in dilating the blood vessels thus allowing an improved flow of blood to the heart. Prevents cancer- Cancer is another life-threatening disease which is quickly becoming very common. While copper may not help in treating cancer but it can help with the prevention of the disease. Copper inhibits antioxidant properties and thus helps in fighting off free radicals and nullify their ill effects, which is one of the most common reasons for the development of cancer. According to the American Cancer Society, the exact explanation is still not available as of how copper can help with the prevention of cancer. But some studies have depicted that copper complexes do have a significant anti-cancer effect on the body. Stimulates the brain- Our brain is working constantly and is never asleep. For each action or movement we make, our brain is sending out orders or impulses from one neuron to another via synapses. These neurons are covered with a plasma membrane called the myelin sheath which acts as a conductor and helps in the flow of impulses. The copper helps in the synthesis of the phospholipids which are crucial for the formation of myelin sheaths. An improved density of myelin sheaths means that your brain will work at a much faster pace. Regulated the thyroid glands- One of the common traits to be found in a majority of thyroid patients is a low level of copper. Though this characteristic is more common in people with hyperthyroidism (increased level of thyroid hormone), is not just restricted to them. Copper is amongst the most crucial trace minerals required by the thyroid gland to function properly. A deficit in the required amount of the mineral can put the gland out of sync. Thus, it is advisable to drink copper water regularly so as to keep the thyroid gland working smoothly. 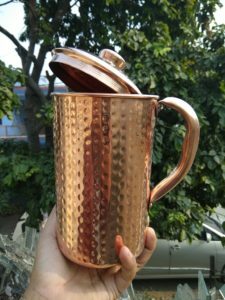 Copper, also known as ‘tamba’ or ‘tamra’ was also one of the most commonly used metals during the ancient times to mold utensils. But what were the reasons behind these claims? Thousands of years later scientists performed research and found that the ancient claims were made on solid, factual grounds. How to Cure Arthritis with Copper Water?